At Pinnacle Equestrian, careful attention to the most minute detail is standard procedure. Even the sand in the facility’s jumping arena is specially shipped in from Utah for just the right granularity and compression. Laser-leveled to perfection, the sand is regularly monitored for moisture content to ensure the highest level of safety for horses and riders. Pinnacle Equestrian is a privately-owned Olympic-level equestrian hunter-jumper facility in the scenic Sonoma Valley, Calif. Owners Ron and Lauren Silva cater exclusively to Pinnacle Equestrian’s hunter-jumper clients. Client horses warm up at the facility before competing in such events as the Longines FEI (Fédération Equestre Internationale) World Cup™ circuit’s annual Sacramento jumping qualifier which attracts the world’s top riders. As for the up to seven young resident horses that do call the property home, they’re in training for future competition. When ready, they’ll eventually be sold to new owners. Pinnacle Equestrian trains horses to jump exclusively in the Grand Prix range (1.4-meter to 1.6-meter or 4.6’ to 5.2’). These heights represent the “pinnacle” of the sport and illustrate the advanced nature of the Silvas’ operation. “Pinnacle really sells itself based on our high-quality standards, how we care for the horses and what we provide World Cup circuit riders who warm up at our facility,” explained Ron Silva. Provide an effective airflow solution within a round equestrian barn to maximize horse and staff comfort while complementing the barn's interior aesthetics. An 18-foot diameter Entrematic I-Class™ industrial HVLS fan mounted to a glulam beam complete with custom-designed wrought iron images of jumping horses. 9,800 cubic feet of air that's replaced every 90 seconds ensuring the year-round health, safety, and comfort of resident horses in training as well as staff. The focal point at Pinnacle Equestrian is the property’s stunning and rare 16-sided, tongue and groove ash round barn where horses stay at night and are tacked and groomed each day. The European-style, 5,200 square-foot barn is sited so that interior temperatures are consistent throughout all seasons. Only when oppressive heat builds due to changes in westerly breezes — normally nature’s air conditioning in the region — is when things get uncomfortable. Each of the barn’s ten stalls has a window for ventilation and to capture ambient breezes. However, when outside temperatures reach 90 to 95 degrees, the horses can become sluggish and uncomfortable. As a result, serious concerns about stress come into play as well as equine colic, a digestive system disorder that can be life-threatening. 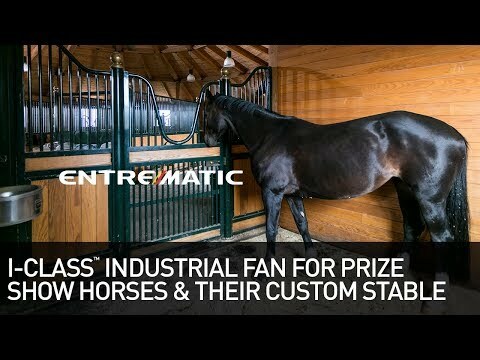 Watch the Pinnacle Equestrian Center customer story video. Ron Silva then began to research high- versus low-velocity air movement as well as various HVLS (high volume low speed) fan manufacturers in a quest to find the perfect solution. Relying on the expertise of Entrematic’s Dan Linder, Sales Manager, HVLS Fans, the solution for Pinnacle Equestrian became the company’s 18-foot diameter I-Class™ HVLS fan mounted directly below the barn’s cupola. The fan, with its blades 20 feet above the barn floor, is mounted on a glulam beam that features waterjet-cut wrought iron images of two jumping horses on either side. “I really liked the fan blade design, which made the most sense to me for moving just the right amount of air,” Ron Silva pointed out. “The fan blades, design, material and weight far surpass what the competition has to offer.” He further explained that due to the barn’s aesthetics, he and his wife did not want to use guy wires that are needed at higher operating speeds to eliminate rotational vibration. “Entrematic was able to work with us on the proper bracing needed to accomplish what we needed without guy wires. Our approach works fine as long as we don’t exceed a certain RPM operating speed. In the best interest of our horses, our intent is to move a high volume of air slowly without creating a breeze sensation and to also lower the round barn’s temperature without inducing humidity,” he said. While exploring another major manufacturer of HVLS fans, Ron Silva related that his experience did not go well. Ron Silva stated that one of the most important reasons he chose Entrematic is because one competitor’s customization claims are simply false. “They say that they’ll accommodate you, but that’s not the case,” he explained. “Functionality and appearance were very important to us, and we wanted the total capability to customize and handle our own installation. The competitor said that would void our warranty unless they installed our fan. We didn’t have the confidence they would be willing to stand behind the warranty if we installed the fan ourselves. The time of year determines which direction the blades rotate. In the summer, the fan pushes hot air down and out through 10 barn windows and other openings to create a cross current while drawing in outside air through six powered windows in the cupola. The reverse is true during the winter when the fan draws in fresh air through the barn windows and then pushes the air up and out through the cupola. The fan doesn’t necessarily change the barn’s temperature, but it does but make the barn environment feel much better to work in. “During colder weather, we keep the horses blanketed, but we try not to baby them too much,” Ron Silva said. “Running the fan in reverse, we’re more interested in improving the barn environment than actually heating the barn.” As a rule, the barn never drops below 50 degrees.